Do you like saving the world from cosmic horror? 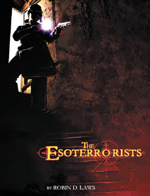 Allow me to introduce you to The Esoterrorists, by Pelgrane Press. The barrier between our world and the world where horrific supernatural entities exist is thin. There are people – the eponymous esoterrorists -- who want to make that barrier thinner, weakening it to the point where these cosmic horrors have access to our dimension. Humanity's collective denial of the existence of the supernatural powers that barrier. The esoterrorists plot ways to bring the supernatural out into the open in ways that humanity can no longer deny. The stronger humanity's belief in cosmic horror, the more likely cosmic horror will come home to roost. On the other side is the Ordo Veritatis, an organization dedicated to saving the world by reinforcing humanity's collective denial. They seek out the events that the esoterrorists perpetrate and cover them up, disguising them as events that normal people can just rationalize away. Sound interesting? From March 15th to 30th, anyone who places an order of $25 or more worth of Warehouse 23 goods can use the promo code 'PELGRANE25' to get a free PDF of the first edition of The Esoterrorists, courtesy of Pelgrane Press! What are you waiting for? Go get your copy!